I used Cygwin a lot and I love it. 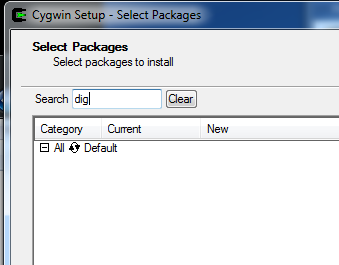 But Last time I did a search in the Cygwin setup for “dig” I get nothing. First I searched for bind. And I chose to install the bind package. Next I searched for openssl and chose to install the openssl package. Then I clicked next a few times and installed these packages. Then opened a Cygwin terminal and typed this. Looks like it’s working just fine. This one drove me nuts for a long time. Thank you, friend from the past.